At Higgins, we’re lucky enough to work with some of Australia’s most successful Strata Managers, and we’re in awe of how they expertly manage the sensitive relationships between body corporate, strata committee, owners and residents. Something we’ve noticed in the most experienced of our Strata Manager customers, is how well they keep residents informed of any property maintenance and upgrade works that are required. Unfortunately, this can occasionally mean having some difficult conversations, particularly when these works are unexpected and/or are accompanied by a rather hefty bill. So we were wondering: when it comes time to discuss a big property maintenance project at the next AGM – like, say, a major painting upgrade – how do successful Strata Managers articulate the value of such a project to stakeholders in a way that keeps everyone happy? Here are 5 ways property maintenance projects, like painting, can deliver a good return on investment (ROI) – especially when done regularly. With special thanks to our contributors. As a tenant, where would you rather live – the property with faded walls, cracked paint and signs of mould and mildew, or the property with a gleaming fresh coat of paint? It’s no contest, right? Well-maintained properties have a higher market value than those which aren’t as well looked after, which is good news for the owners, particularly if they’re looking to rent out or eventually sell their units. To help ensure the property always looks its best, it can be a good idea to take a preventative approach, whereby maintenance painting is undertaken on a regular basis. Maintenance work, particularly if it is done regularly, can help prevent even more costly damage down the track. 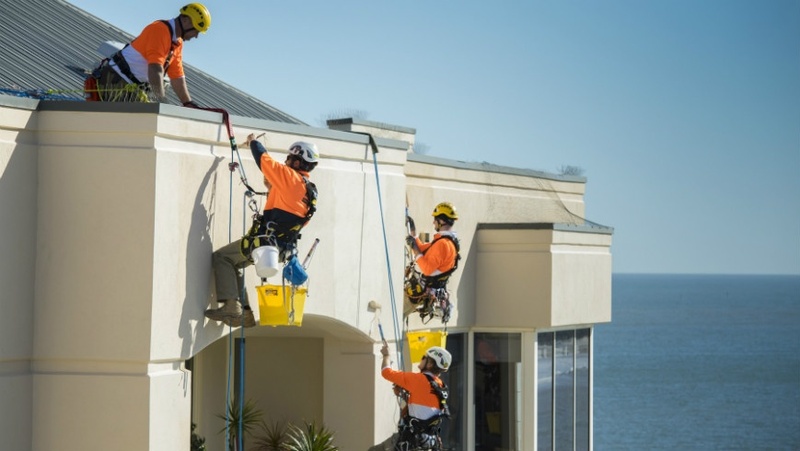 Exterior paint, for example, doesn’t just make a building more visually appealing, but it also shields the surface against water, sunlight, salt, mould, mildew and even pests such as termites. This is particularly important for seaside properties, which are highly exposed to the elements and are therefore more susceptible to damage. When a property is being prepared for a big maintenance project like a major paint upgrade, it is carefully inspected. This means that any signs of damage, decay or rot on any of the surfaces are caught early, so they can be addressed before the problem deteriorates and causes far more serious – and far more costly – issues. A preventative maintenance approach is even more beneficial, as it means more regular inspections, ensuring any such problems are nipped in the bud before they have a chance to grow. It is not unusual for maintenance and budget planning in residential strata schemes to occur on an ad hoc reactionary basis, with things being fixed as needed. If there are inadequate funds in the sinking fund, this can result in owners being saddled with significant extra costs and levies to make up the difference – and this could mean you end up on the receiving end of complaints from some very disgruntled owners. Rather than completing a major paint upgrade every 7–10 years, as is typical, a preventative maintenance approach, whereby smaller paint jobs are completed on a more regular basis, can spread out the withdrawals from the sinking fund, leaving more in the coffers for any unexpected expenses that might crop up, and preventing the need to request additional funds from owners. As mentioned, this approach can also help to prevent damage, further minimising costs, and areas are addressed as needed, meaning less unnecessary spend – for example, if a surface that is scheduled for repainting doesn’t actually require it, the surface can be cleaned instead, at a lower cost. Again, this applies more so to a regular maintenance approach. When major works are undertaken across the entire property once every several years, this often results in huge inconveniences for the residents, who have to deal with excessive noise and common areas being inaccessible. Depending on the level of work required, they may even need to temporarily vacate their apartments. With a regular maintenance approach, however, areas are addressed progressively in smaller increments, meaning much fewer disruptions to the residents. Undertaking preventative work regularly also means there is less need for more intrusive repair work, which again means less disruptions. By arming yourself with these positive statistics, as well as a proactive approach to maintenance, you can ensure happy stakeholders and a quick and pain-free AGM. Want your next AGM to go as smoothly as possible? Then make sure you download our Must-have guide to holding a super-effective strata annual general meeting, which will tell you everything you need to know to run a successful AGM. Download it now!